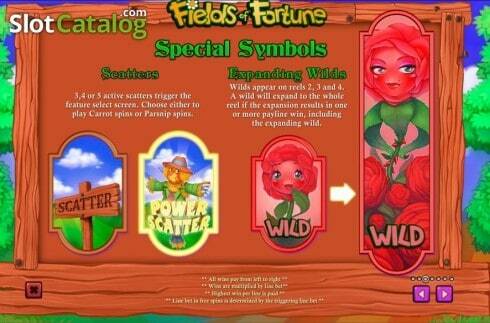 Fields of Fortune is a 5 reel and 25 payline online slot game by Playtech. The game has farming/ gardening theme which is incorporated thoroughly, even the usual playing card symbols are created using green beans, carrots and parsnips. The reels themselves are transparent but take place within a rustic wooden frame. In the background there are trees, blue skies, fluffy white clouds and rolling hills. The graphics are done in a cutesy cartoon style and the reels feature a variety of adorable flowers that are bursting with personality. The low value symbols of the 5 playing card symbols pay out between 50x and 150x your bet for the winning combination of 5 in a row. The garden tools of the Cutters and the Watering Can are also worth 150x your bet for 5 in a row while the Blue Flower and Pink Flower are both worth 300x for the same combination. The Orange Flower is the highest paying standard symbol and is worth 1000x your bet if you land 5 on an active pay-line. In this round players will be rewarded with a multiplier that increases with every Scatter Symbol that lands on the reels during the rounds. Every time a Scatter lands on the reels it will turn a Flower symbol Wild on the reels. Players will be able to choose whether or not they would like to use the Power Scatter feature in this round. If they do it will double the value of the bet and increase the chances of landing more free spins. The Wild Symbol in this game is the icon of the Red Rose. The Red Rose has the power to replace all the standard symbols in the game except for the Signpost Scatter and Scarecrow Scatter. The Wild only appears on reel 2, 3 and 4. The Wild will expand to cover the entire reel if a winning combination is possible. The game has an 'AutoPlay' feature that allows the player to spin the reels automatically on a predetermined bet and a predetermined amount of spins. There is also a 'Turbo Mode' that speeds up the game even further making for lightening fast game-play. The Wild is the symbol is the Red Rose symbol that can replace all the Fields of Fortune Symbols except for the two scatters. It is also an Expanding Wild which covers reels 2, 3 and 4. 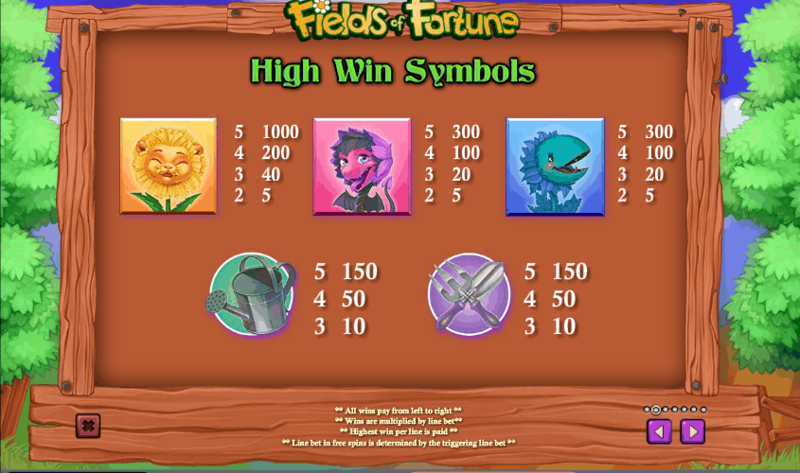 Fields of Fortune is a cheerful and enjoyable online slot game from Playtech. Although the set up is relatively simple, there are unique bonus features and profit potential to enjoy. The game works seamlessly and smoothly on a variety of devices and one of the biggest draws of the game is its eye-catching graphics.